The United States is a country of scenic vistas begging to be photographed. The Grand Canyon, majestic mountains and rugged coastlines bless amateur photographers with places to sharpen their skills. However, many amateur photographers wind up disappointed when their snapshots don’t do the place justice. This article will offer tips and tricks even beginner photographers can use to capture these natural landmarks’ beauty and majesty. At the Grand Canyon and other spots that get a lot of tourist traffic, it can be challenging to take shots that don’t look like you were at the zoo; a line of heads at the bottom and the main event at the top. While having a carefully framed human or two in your photos helps the eye find perspective and captures the canyon’s vastness, catching a tour bus full of people in your landscape looks bad. The compulsion is to crop out errant passersby or to Photoshop them into oblivion; the better idea is to frame your pictures without people. To do this, you might need to get up early. 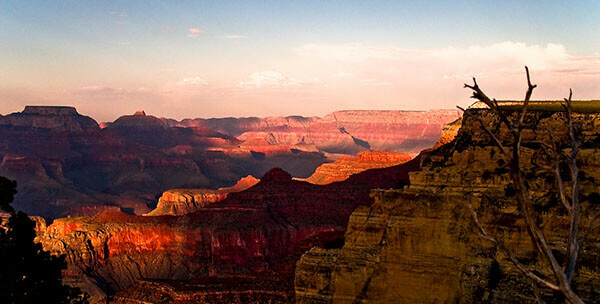 Check out hotels near Grand Canyon to stay at so you can be the first one at the park when it opens. You’ll have the bonus of better light and nifty shadows, perfect for catching the reddish colors and definition in the strata of rock. Deserts are a great spot for photos. The rock formations and colors there will have even the most casual photographers salivating as they reach for the camera. It’s hard to take a bad photo of Sedona, Ariz. (unless you leave the lens cap on), but here are some tips for getting better pictures when you head to the desert. First, get out of town. The best way to find unexpected shots of anything is to drive around and look for them. The desert’s light is best in the early morning and late afternoon, with midday photos sometimes appearing washed out. Bring a polarizing filter, if your camera supports one. This makes sure the clouds and sky pop in your photos. Neutral density filters are well-used here too. As with the Grand Canyon, when photographing mountains like Mount McKinley (also called Denali) you want to balance your photos of huge things with macro images to give your portfolio a variety. When taking photos of mountains and other large subjects, embrace the feature’s smaller aspects. Focus on details, textures and patterns. Remember the sun plays differently on the sides of the mountain at different times of day, so it’s worth revisiting the same vantage point at intervals and seeing how the shot has changed due to light. If your goal is to shoot wildlife photos, bring a tripod, bug netting and repellent. Talk with park guides to help you find the best and safest locations. When you want to capture water in a photo, think of the sky. Remember your digital camera’s sensors are set to measure everything in the picture - so if you’ve got dark water and a light sky, it’s going to create an average. This may result in a murky or washed-out image. Experiment with spot metering, your white balance settings and contrast adjustment to see what captures the mood you want best. There’s plenty of opportunity for moody, contrasty images, but you need to check weather reports first. On either American coast, it’s a good idea to come prepared for wet weather. Umbrellas, cover-ups and waterproof bags for your camera equipment are essential. If you are not sure if you can take photos in the rain without getting your gear wet, don’t risk it. Any time you photograph moving water, like when shooting Mississippi River traffic, you can have fun with your shutter speed to create misty or “soft” effects, giving a sense of timelessness to the photos. You’ll need a steady tripod for this kind of photo. Set a self-timer so when you hit the shutter button, your hand doesn’t cause any lingering vibrations that show up in the picture. About the Author: Anna Novack gives photography courses to seniors in Los Angeles, and leads frequent photo trips to the Grand Canyon and Yosemite National Park. Last updated by jack on 24 March, 2013 in Travel.